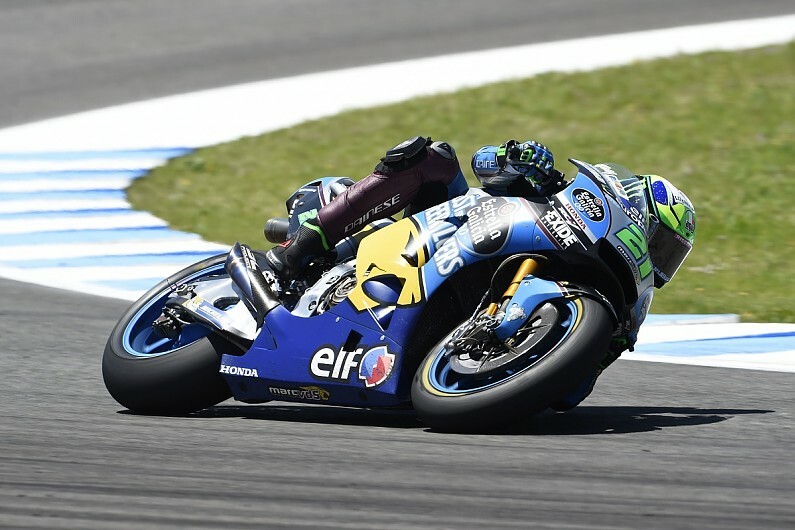 Tech3 Yamaha rider Johann Zarco topped MotoGP's post-Spanish Grand Prix test at Jerez with a time less than a tenth away from Cal Crutchlow's lap record. As well as Zarco, all Honda and KTM riders, the works Yamahas, Pramac Ducati's Jack Miller, Nieto's Alvaro Bautista and Avintia pair Tito Rabat and Xavier Simeon took part in the test. Rabat, Marc Marquez and Maverick Vinales took turns at the head of the times during the first two of the test's eight hours, before Crutchlow took over at the top with a 1m37.006s lap. The Briton improved again on his next effort but he was narrowly outpaced by Zarco, who set a time of 1m37.937s. The top two remained the same for the rest of the test - which also offered riders the opportunity to sample a brand new soft rear tyre supplied by Michelin - although Zarco did lower the benchmark before the end of the session. He finished the day with a best time of 1m37.730s - 0.077 seconds adrift of the record-breaking pole time Crutchlow set in qualifying on Saturday. Dani Pedrosa was third on his factory Honda, just 0.033s slower than Crutchlow. Vinales was fourth and the fastest of the factory Yamahas, separating Pedrosa from team-mate Marquez as the Sunday race winner made it three Hondas in the top five. The factory Honda team used the test to trial a new fairing, with Marquez comparing three different specifications during the day. Marc VDS Honda rider Franco Morbidelli was half a tenth slower than Marquez in sixth, followed by Rabat and Takaaki Nakagami on the second LCR bike. Morbidelli's team-mate Tom Luthi caused a brief red flag during the test after his bike landed on an air fence after a crash. Miller and Rossi - who was 0.943s slower than Zarco - completed the top 10, while Bradley Smith beat KTM team-mate Pol Espargaro by 0.010s for 11th. Andorran rider Xavier Cardelus, who raced at Jerez on Sunday as a wildcard Moto2 entrant, also took part in the test for Avintia. He ended the day slowest of the 17th riders, 5.3s behind 16th placed rider Simeon. The factory Ducatis, Danilo Petrucci and Karel Abraham were absent along with the Suzuki and Aprilia riders.